So you didn’t really expect that I was winding all that lace-weight silk with no plans in mind, did you, gentle reader? Nah… I thought you knew me better than that. Thraven was slated for The Wings Of A Dream, and that is what it is becoming. I swatched yesterday, decided I liked the swatch, and went for it. I’m using my Options Harmony needles, and I just love them for knitting with this silk. They have just enough grab to hold on without being a drag, if ya know what I mean. I’m sort of obsessively knitting on this project right now. But I can see already that it’s not something I would dare use as take-along knitting. It needs too much attention. The highlighting tape, by the way was a prezzy from my Sockapalooza pal, Marie. Today I am not joining the throng out in search of a good deal on Black Friday. This actually starts my do not shop in malls season. For many years I have pretty much refused to go into a mall any time between Thanksgiving and New Years. While I love to shop, I hate crowds and crazed, stressed fellow shoppers. But today there is another reason. Today is Buy Nothing Day in the US – a day that aims to help people think about how they can live more simply all year, and not just today. Black Friday, of course, has more significance here in the US than in other countries. World-wide Buy Nothing Day is celebrated on Saturday, 11/23. When #1 Son first told me about Buy Nothing Day, I said, I’ve done that for years! It might have been the first time he thought that his poor old mom actually had a glimmer of intelligence (hard as it is to believe). If you were out braving the crowds today, I hope you had a great time and found many bargains. But do consider bringing the philosophy of Buy Nothing Day into your life on other days. Tomorrow, is Buy Local Day here in Portland. This is a day organized by The Sustainable Business Network of Portland, a group that sponsors Think Local Portland. In the spirit of Buy Local Day, may I suggest patronizing your local yarn shops? 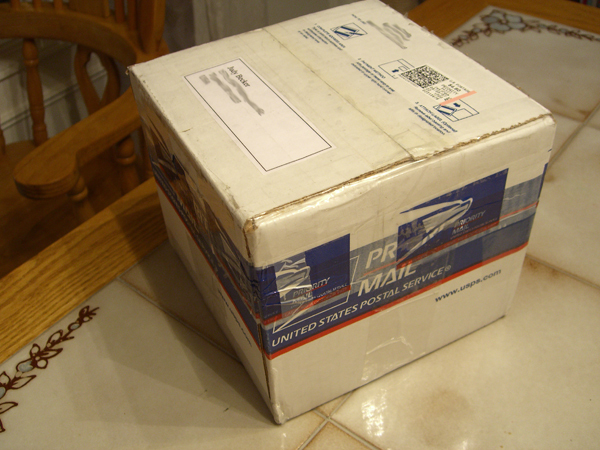 A mysterious and intriguing box that came from California. Could this be from my Sockapalooza pal? 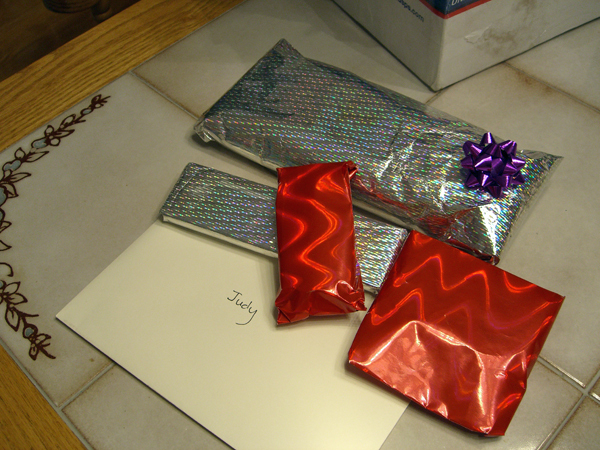 Little brightly-wrapped packages and a card with my name on it. What can it all be? There are instructions for opening. OK. I will be good. But you have to know it was tough! 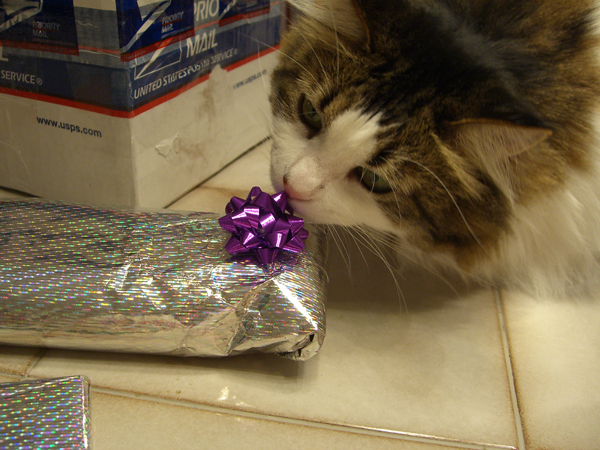 Moo Cow: Can I open this one, Mommy? I like bows! Mom: NO! Besides, you eat bows. That’s not what they were intended for. Moo Cow: OK. 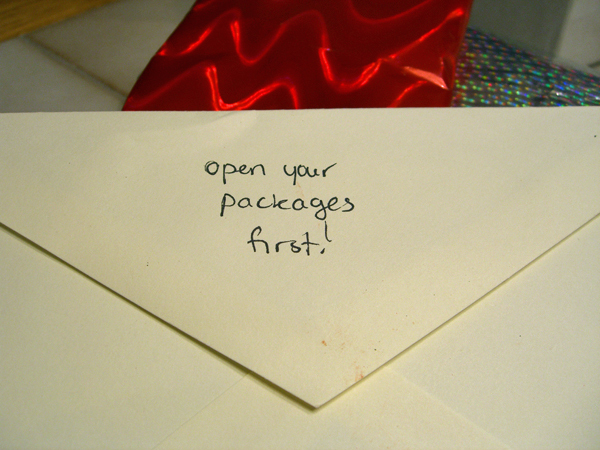 I will let you open it. If you insist. Look at all that was inside! Highlighting tape for use with lace charts. Scharffen Berger Chocolate — my favorite! A picture of a whale (opened last, per instructions!). And a wonderful pair of green and yellow Monkeys. They were wrapped in a really cool official Sockapalooza sock band that you can just see peeking out from under the socks on the far right. You can see the socks packaged with the band right here. But I, in a frenzy of opening, missed that picture. And now my feet are happy! I can’t wait for it to be wool-sock-wearing weather. Thanks, Marie! I love everything, and the socks fit perfectly. 😀 What a great Sockapalooza Pal you are! Look! A commemorative Sockapalooza 4 bag! I ordered this one (for my Sockapalooza pal) here from Allena at Knitting Ewe On The Go. OK… I ordered a second one for myself, because isn’t this just the cutest thing? Allena has several different fabrics in different colors and the completely-reversible bags can be ordered in any of the choices. You can even have the inside different from the outside and the tops different from the bottoms. 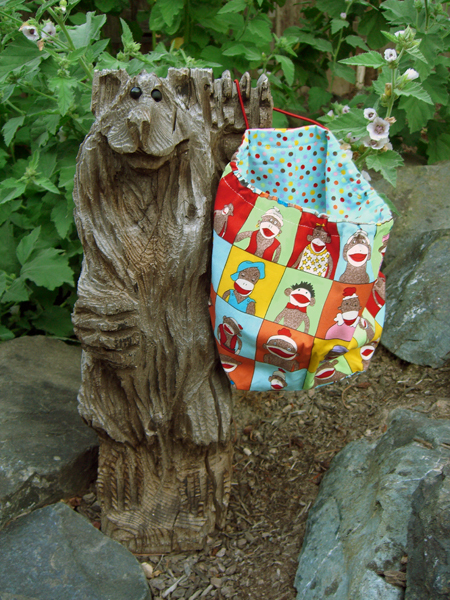 I ordered my pal’s bag with the spotted fabric on one side, just in case someone isn’t wild about little monkeys. My bag is three different monkey fabrics, because I’m a monkey lover. 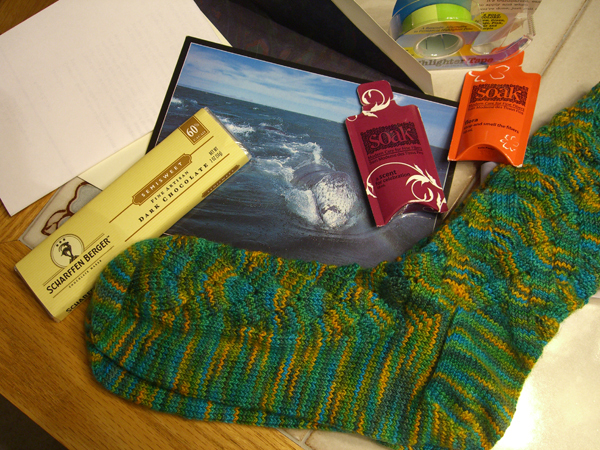 There’s not a lot of time until Sockapalooza Mail Date, but Allena was great about getting mine out really quickly. And… you can always order one just for you! Heck… order one even if you’re not a Sockapaloozer, because they’re just so dang cute! I am looking to try knitting a shawl this winter, do you think the â€œGreat Green Globâ€ would be a good pattern to try as a first lace shawl project? Yours is looking wonderful. I had to think about this one for awhile. 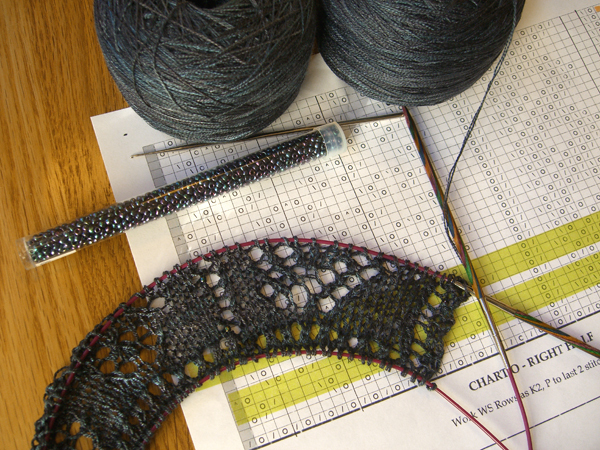 But I think I would not recommend this particular project for a first lace shawl project unless you already had at least some lace under your belt (so to speak). Except for the plain garter rows between motifs, every single row in this pattern is different. That means that I always have to haul the charts around with me because there’s no way to memorize the pattern. And because the pattern can’t be memorized, it’s hard to get into the rhythm. It doesn’t make a very good traveling companion. Also, there is a knit-on border, and that’s tougher than having the border part of the shawl pattern itself. And when you finish that, there’s still the I-cord edging to do. A lot of it, because it’s a fairly big shawl. All that being said, however, the stitches themselves aren’t terribly difficult. The motifs are mostly YO’s for increases (with a few M1s), and SSK and K2tog for the decreases. There’s also a Slip 2, K1, psso that the pattern abbreviates sskp. And that’s as tough as it gets. But if all that doesn’t scare you off, I’d say go for it! The Koigu and I had words. After it practically crawled out of the stash bin, insisting that it must be knit, I wasn’t going to let it get away with not telling me what it wanted to be. Several swatches later, I forced it to cough up its secret. It had delusions of dragon-ness. The stitch pattern is Dragon Skin, from one of the Barbara Walker Treasuries. 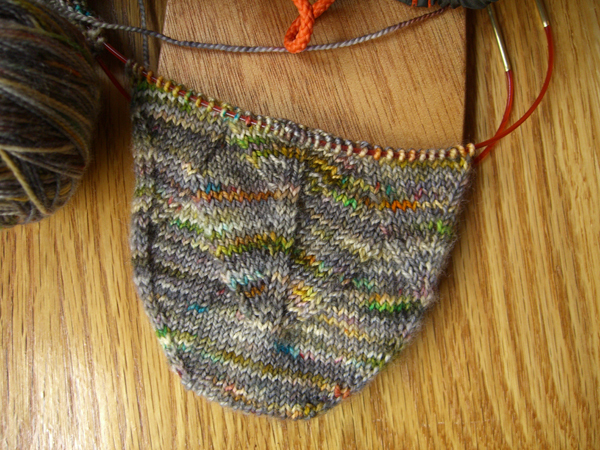 The stitch pattern, as written, didn’t fit into the gauge I got going around my foot with the Koigu. I had two choices: I could make the pattern smaller, fitting more repetitions in one round. Or, I could make the stitch pattern larger, with fewer reps in a round. I opted for the latter because I thought that the larger scales would play with the colorway better. I love the way that the yarn is mostly grays, with little blings of gold and orange and green and blue. If I were a dragon, I wouldn’t mind being gray if I could wear multi-colored sparkles. 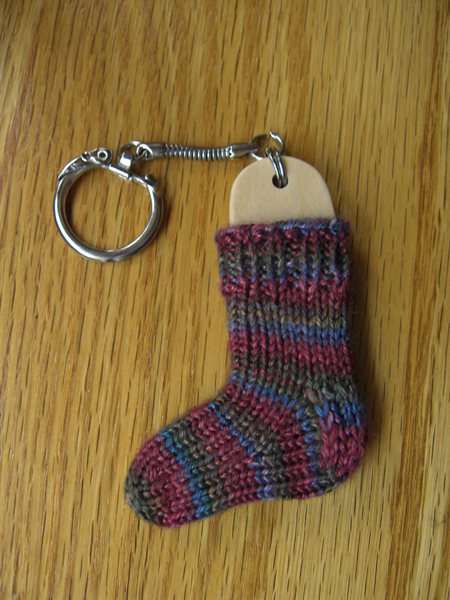 And this is a little keychain sock-blocker that I knit a little sock for. It will be going to my Sockapalooza pal along with the Java Leaf Socks. The yarn is a tiny bit of leftover Seasilk from another project. When going through the stash looking for the last of the Cherry Tree Hill so the little sock would match the bigger socks, I ran across the Seasilk. Since the colors are reasonably from the same family, I thought it would be fun for my Sock Pal to have an almost-matching but slightly swankier keychain. Now… I have a question for you, gentle reader. Saturday I went to a muggle party. It was a fun party and I had a great time. As we all sat around the back yard (perfect BBQ weather), sipping on beverages-of-our-choice and such, I whipped out the dragon scale socks and started knitting. Is that a nervous habit that you have? one of the other guests asked me. Nervous habit? I replied. I have to admit I was sort of speechless — and you know, gentle reader, how rare that is! But I really wasn’t quite sure how to respond when my chosen craft was relegated to the level of… I don’t know… a twitch or foot tap or something. I knit because I really enjoy it and it’s relaxing, I finally said. The other guest nodded. But I could see that I had just validated for her that what I did was… A Nervous Habit – capitalized, but nervous nonetheless. I was a bit put out. But after I thought about it… I knit when I’m waiting in line, or I have a quiet moment, or I want to keep my hands busy, or I want to relax. What do you think? Is there a tiny grain of truth in that question? Is knitting nothing more than A Nervous Habit, or should all nervous habits somehow be raised to the level of craft? P.S. For those who commented on the Brioche stitch on the Java Leaf Socks. I wasn’t sure if that’s what I should really call it. The first round is worked as YO, K1, P1, repeat. In the second round, the YO and K1 are knit together, and the P1 is purled. So, while the knit stitches are, I guess, technically Brioche, there’s the purl stitches there that make it… something else. Brioche rib? 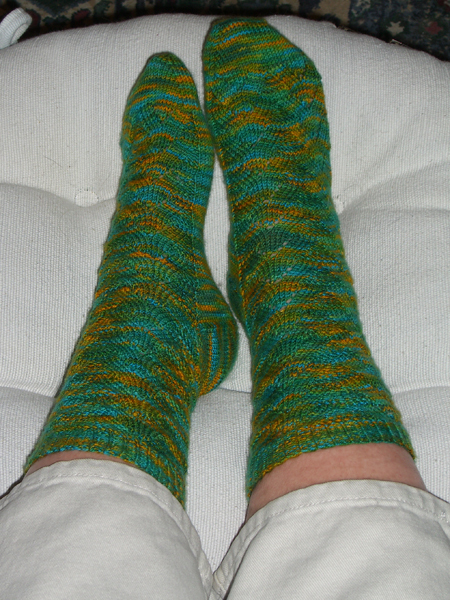 I have finished the Java Leaf Socks for my sockapalooza pal. Yea! I enjoyed knitting these. But I have to admit that I’m glad to have them finished. For some reason it took almost 1/2-way up the legs before I finally got the (fairly simple) lace pattern planted in my alleged brain. So these socks required concentration and that lengthened the time it took to complete them. That’s fine every now and then, but I usually consider socks to be “no attention needed” knitting. I’m very pleased with the results. Despite the picture here, there really are two socks. Hey… hanging sock blockers up on grape vines is not all that easy! The color is darker and richer than these pictures show – think good, black coffee. Although it’s a hand-painted yarn, it doesn’t compete with the lace pattern at all. In fact, when I saw the stitch pattern in an old, old book belonging to a friend, I thought of this yarn right away. I tend to sort of make things up as I go along, and these socks were no different. I did swatch before starting to make sure I understood how the lace was made. But once into the sock I realized that the pattern would not go 4 times around the leg (my original plan) at the gauge I was knitting. Plan B, therefore, was to knit a simplified, slightly narrower leaf pattern on the sides of the sock, and the full-width pattern on the front and back. This picture is a close-up of the front and back stitch pattern. You can see that there are two vines of leaves, and each side always slants the same direction. The simplified pattern on the sides has one vine, and the leaf slants alternate. The four sections are separated by two brioche stitches. 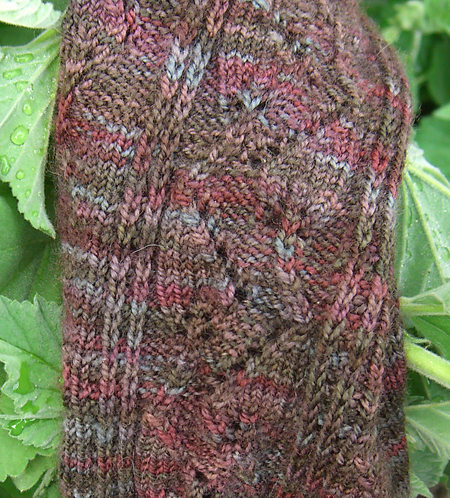 I used brioche instead of ribbing at the top of the sock to match the stitches on the side. I really like the way this came out — very stretchy and squooshy, but with the hold of ribbing — and I will probably use this technique on other socks. The heel flap is in standard slipped heel stitch to match the look of the brioche. You can see in the picture below that I started the vines all the way at the tip of the toe. Only the vines travel upwards until nearly the end of the toe increases, and then the lace starts. I thought that lace on the toes might be uncomfortable. Vines also zigzag up the sides to join with the simplified leaf pattern above the heel flap on the ankle. 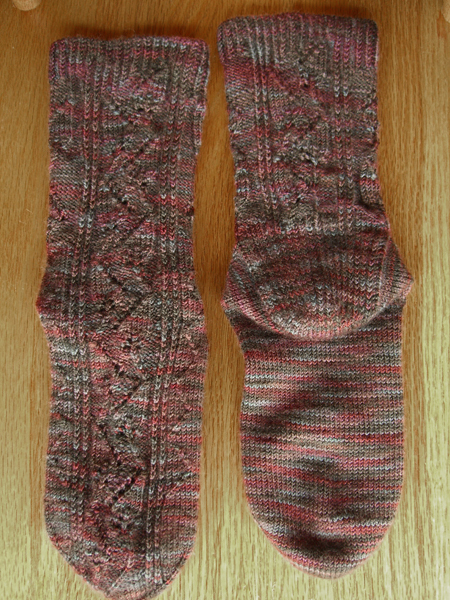 I have to admit that these socks were a stretch for me, in color and in pattern and because I rarely knit lace socks. But they were an enjoyable knit. Alas they will be one-of-a-kind, because I didn’t take any notes while knitting them. They will be winging their way to my Sockapalooza pal on August 2nd, along with a few other little goodies that my pal might find enjoyable. 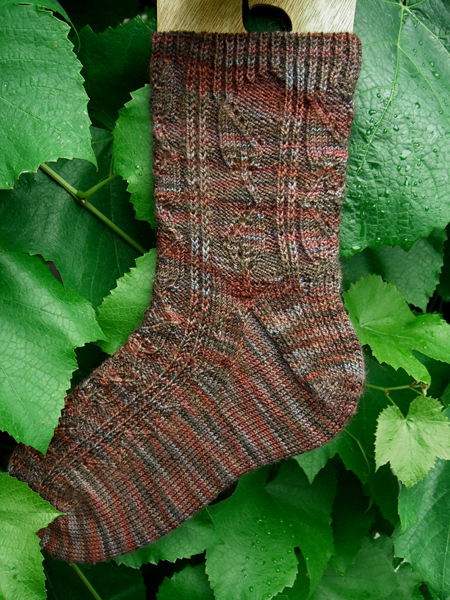 Yarn: Cherry Tree Hill Supersock (100% Superwash merino/ 4oz, 450yds per skein) in colorway Java — most of one skein. Needles: two 24″ Knitpicks Classic circulars, US#0 (2mm). Pattern: A leaf lace stitch pattern from an old, old book, used with my own standard sock pattern. The heel flap is worked in heel stitch. 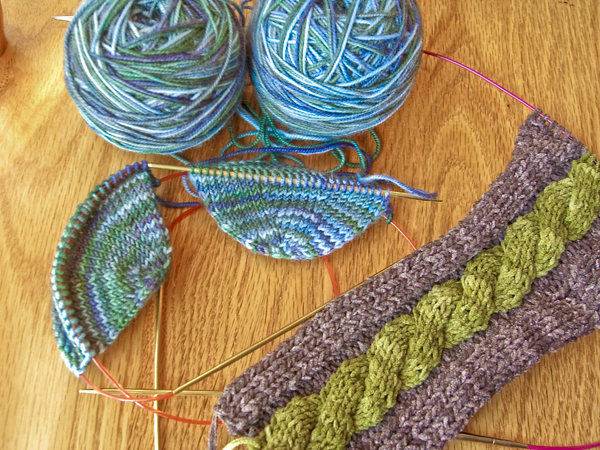 The cuff is brioche stitch.